Are you doing everything you can to make sure your breasts are healthy? If this question gives you pause, you're not alone. Confusing media and conflicting advice surrounding breast health can make it challenging to know what's best. In the United States this year, more than 40,000 women will die from breast cancer. Dr. John G. West wants to help you avoid becoming part of that statistic through preventative methods and screenings. And for women who are diagnosed, Dr. West provides guidance and wisdom to make the best possible treatment decisions. For nearly 20 years, Dr. West has focused on giving his patients the best care possible when they show up for diagnosis or treatment. The question he gets most often from his patients is: "What would you tell me if I were your wife or daughter?" Prevent, Survive, Thrive: Every Woman's Guide to Optimal Breast Care is the answer. Drawing from the latest scientific findings in the field of breast care, Dr. West outlines the things most women don't know about screening, like when you should insist on an ultrasound instead of only relying on mammogram results or how to determine if you should get genetic testing--and what it can and cannot tell you about your cancer risk. He lets you know exactly what kind of pain is normal and what should be investigated further. Dr. West even offers lifestyle advice to help lower your risk factors; things as small as how often you exercise or where you carry your cell phone can have an impact on your future health. Prevent, Survive, Thrive provides clear, accurate guidelines for prevention and early detection--letting you take control of your health. 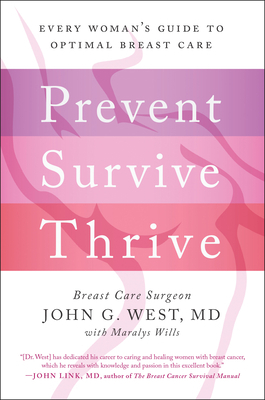 A general surgeon by training, Dr. John G. West became fascinated with the multidisciplinary team approach to breast cancer care in the mid 1980's. His previous experience as a pioneer in the development of regional trauma systems set the stage for his interest in developing a team approach to breast care. Dr. West opened Orange County's first breast care center in 1988, and over the past 20 yrs has been on the cutting edge of developing a team approach to the care of patients with breast problems. He was cofounder and chairman of the board of the Be Aware Foundation, which is a community outreach program dedicated to the early detection of breast cancer. Dr. West has been named a Best Doctor in America and has been recognized as one of the "Best Doctors in Orange County." He has been the lead author in 20 peer review articles and has written two previous books. Maralys Wills's has published 16 books spanning several genres and publishers. Her fiction works include four romance novels published by Harlequin and Silhouette and a techno-thriller Scatterpath about airplane sabotage. Among her ten nonfictions are two books on writing: Damn the Rejections, Full Speed Ahead won its category in Best Books (Stephens Press); a treatise on addiction (Hazelden); and four memoirs (Longstreet Press, Stephens Press). Three of Wills's volumes have won national awards. For 30 years Wills has been teaching novel-writing and memoirs, and in 2000 was named Teacher of the Year. With her lawyer-husband, Rob, she raised six children, five boys and a girl.